The 3rd Mekong Forum on Water, Food and Energy was held in Hanoi, Vietnam, from November 19-21, 2013. KCL was well represented at the forum organising Session 2 on Cross Border Dialogue: understanding how to best manage the transboundary benefits and costs of hydropower development within the Water-Food-Energy Nexus and Session 14 on Governance, institutions and decision-making about dams. The forum was organised by the CGIAR Challenge Program on Water and Food and co-hosted with the Institute of Water Resources Planning, Ministry of Agriculture and Rural Development, Vietnam; and the Mekong Program on Water, Environment and Resilience. What has the CPWF achieved through its work in the Mekong Basin? Based on current trajectories, what will the Mekong Basin look like in the future? How do we want the Mekong Basin to look in the future, and how would we achieve this? Twenty-one sessions were held over three days. Two hundred and thirty-seven delegates attended, representing 92 different institutions. Interactions were intense, far reaching, cordial and highly informative. Water funds have become an established mechanisms to better share the costs and benefits of water and hydropower provision between downstream water users who invest in the fund and upstream land managers who can receive investment for improved land management with benefits for downstream water quantity and quality. Developing the business case for water fund investments involves understanding which interventions to develop where in the catchment in order to improve water quantity and quality at the critical areas downstream at which hydrological ecosystem services are realised. Today in Loja, Ecuador, TNC and King’s College London are working together to deliver a training course “Financial mechanisms for the conservation of sources of water” in how to use the RIOS and WaterWorld tools together to better advise on afforestation and forest protection strategies in catchment like the Paute in Ecuador where such investments could achieve multiple objectives in the conservation of nature, improvement of hydrological ecosystem services and hydropower production at the Paute dam. The analysis carried out is described here. 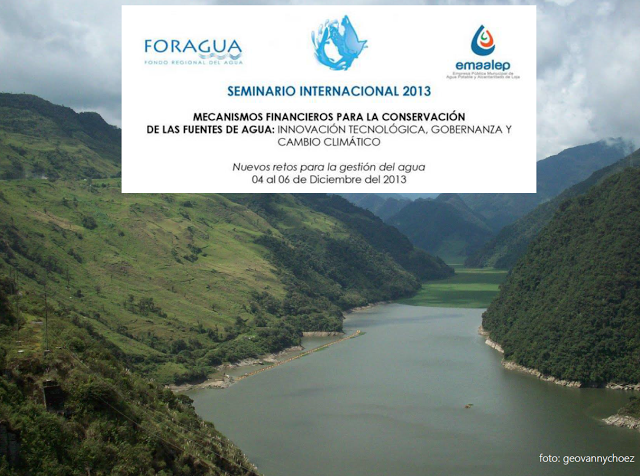 The course involved 23 people from water companies, NGOs, universities, water authorities and local governments: mostly technical staff working on water management, as part of the Foragua water fund. This water fund has been operational since 2009 and currently includes about 20 of the 30 municipalities draining into the Paute, and charges a fee to all users which is directed to the conservation of the upper basins and water intakes.